We've got a bit of bad news for fans of classic co-op. Remember the Genesis poll from a few months ago? ToeJam and Earl won that poll, and Sega promised that the alien duo would be headed to Xbox Live Arcade soon. It turns out that's not the case, according to the couple's creator, Greg Johnson. Apparently Sega forgot that they don't have publishing rights to ToeJam & Earl. Awkward, huh? The two uber-cool aliens won't be making an apearance in upcoming title Sonic and Sega All-Stars Racing either. 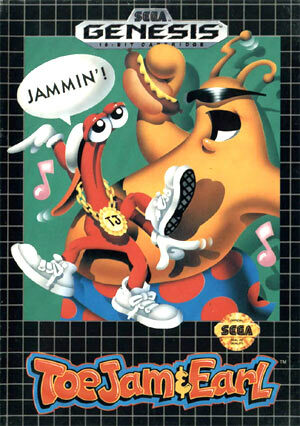 Perhaps most interesting is news of a ToeJam & Earl game proposed for the Nintendo DS. Some interesting concept art and even a few mock-up screens are available at Joystiq. It's a shame, really. ToeJam & Earl was an interesting, unusual game for its time, and would seem to be a good fit for a portable, dual screen remake. Let's hope things get back on track for the XBLA release, at least. Page created in 0.7463 seconds.